Sadly I’ve read a lot of reviews from people who don’t own this saying ‘why would you when people probably own the DVDs anyway’. Well I already did, twice over but this is a Collector’s edition and if the wonderful packaging and board books weren’t worth it there are a few extra special features which sealed the deal for me. Salazar Slytherin’s Horcrux Locket is created by the Noble Collection and it’s a lot prettier and more detailed than I thought. I think it even makes the sound it makes in the movie when you wiggle the chain (but that’s probably just me). 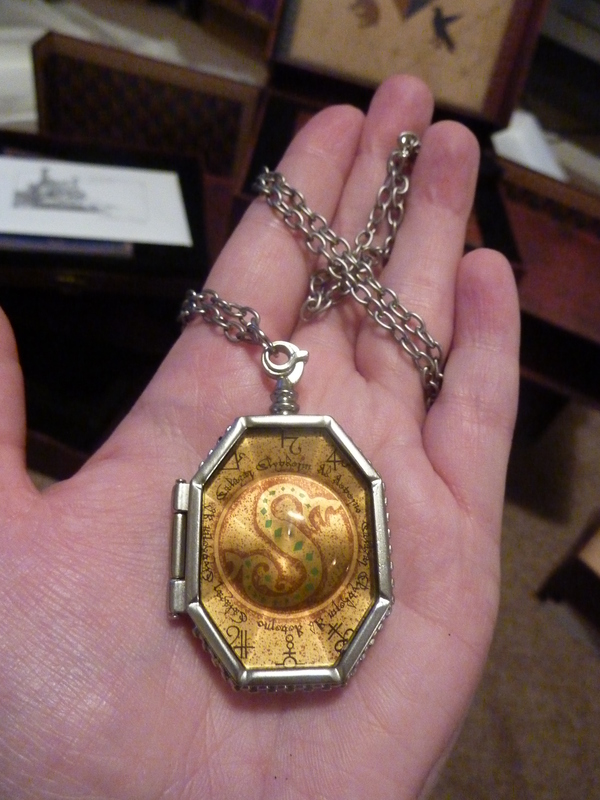 On the Wizard’s Collection website (http://www.harrypotterwizardscollection.com/), where you can cast spells to see the information about the different elements of the box set, the production designer talks about designing the locket down to the snake style pendant clasp on the top. 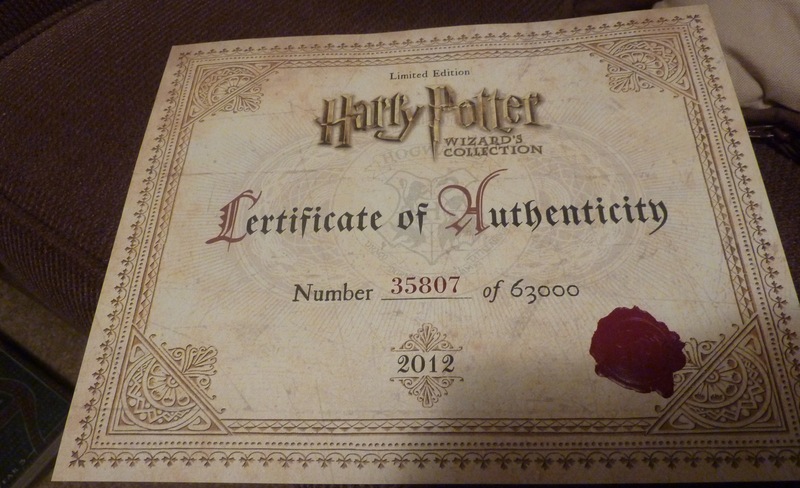 It comes in a black box with gold writing that says Harry Potter Wizard’s Collection and has a liittle Prodcts Inspired by certificate from Noble. This silvery coloured locket is not that heavy and has a pyramid style perspex front. The background is yellow with runes and writing surrounding a central circle with the Snake S with green diamond scales. 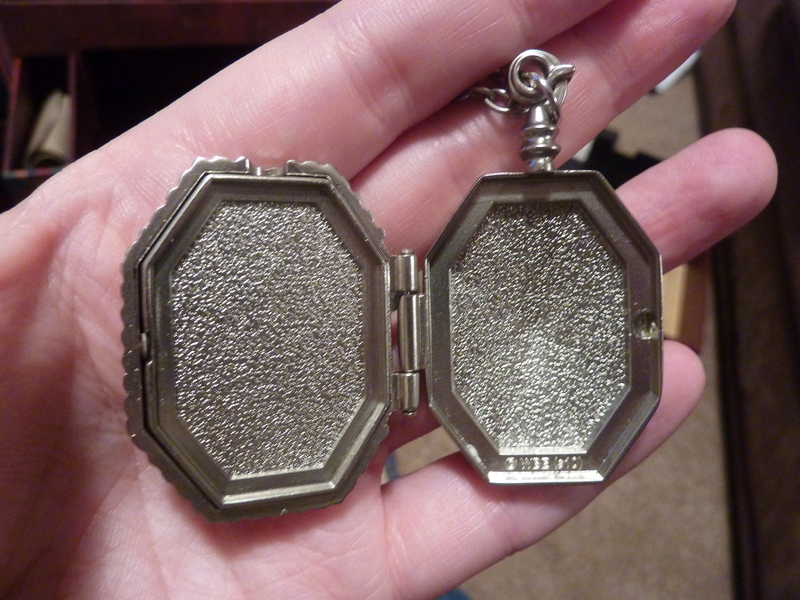 The locket does open so I need to work out something cool to put into it. Maybe I should take inspiration from this blogger on Tumblr and add a picture of Zefron – http://voldemortoutbitches.tumblr.com/post/6807535147 – AVPM fans will giggle at this. It can be found in the right hand coloured secret department, just push in to open (make sure you close it again before trying to close the set. This can be found in the top secret compartment and is in a sealed plastic bag that you have to break to open. It is (according to the website) on no tear paper – I’m not going to try it but it is fairly thick and glossy. 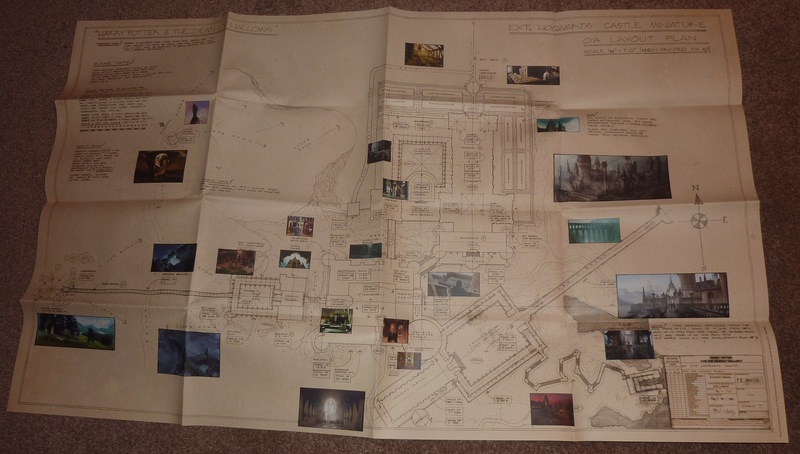 It shows ‘blueprints’ of Hogwarts from The Deathly Hallows with small images of scenes from the films to show the ‘real’ location. 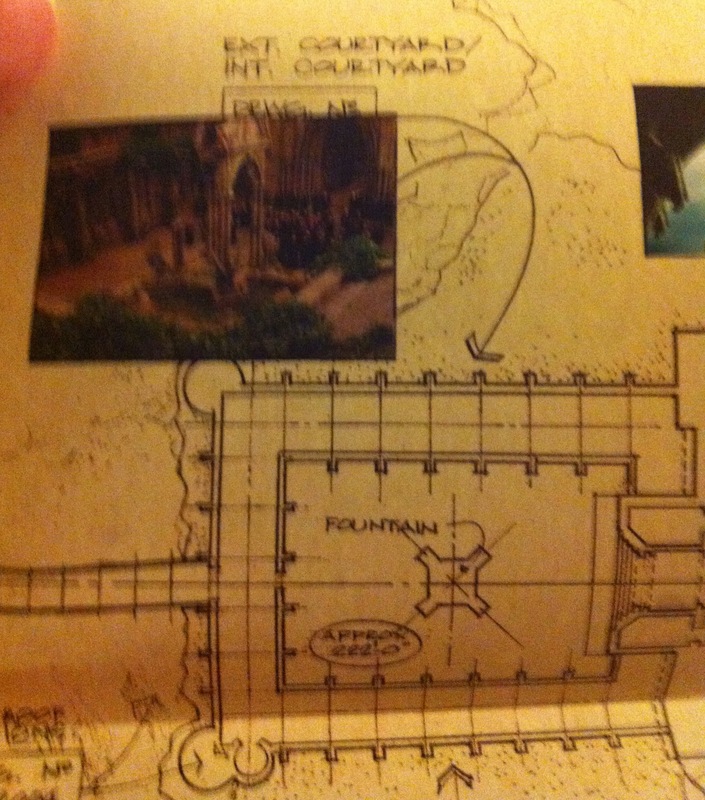 Below as well as a picture of the whole map are close ups of the Owlery and Courtyard. This was the item that sold it to me when I saw the stars opening it. 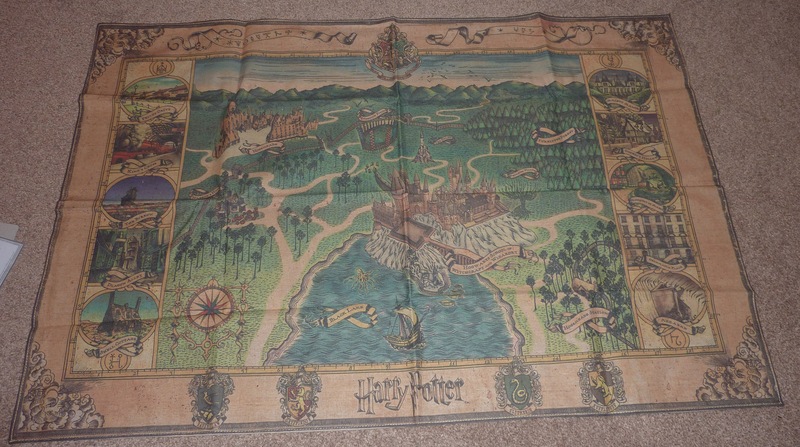 A lovely Cloth map of Hogwarts and its surrounds. It comes with ironing instructions – I’m too scared to do that so if I do decide to hang up think I’ll ask Mum kindly to do this for me. 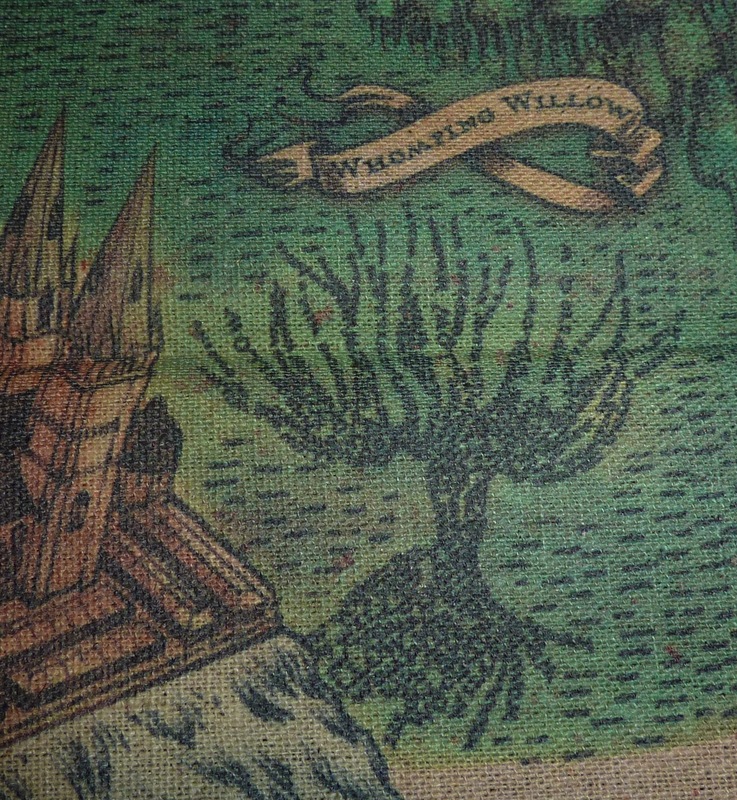 A full picture is above as well as The Whomping Willow and Godric’s Hollow below. 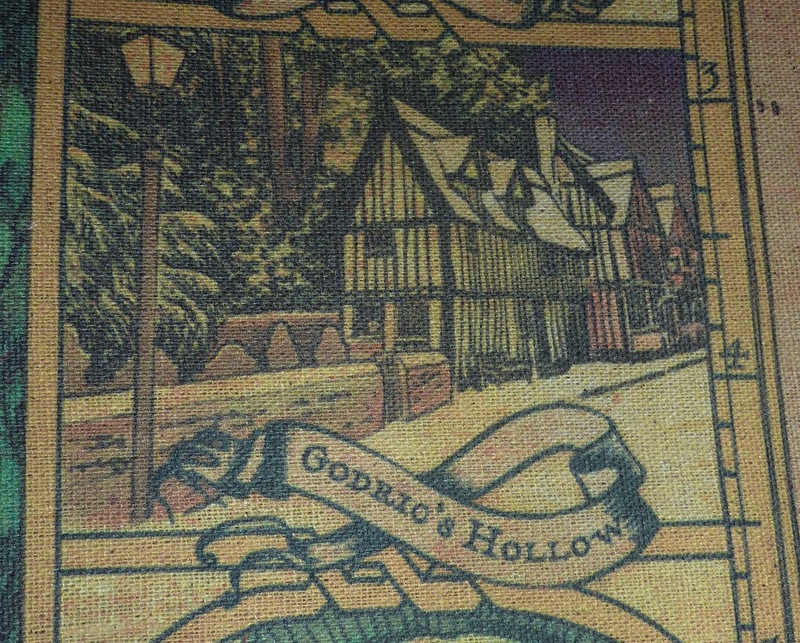 And of course Hogwart’s School of Witchcraft and Wizardry is at the centre. Now although I’ve already been twice I hadn’t actually seen a leaflet for the tour so was actually a little bit excited by this. It is a third of A4 fold (but 4 sides). 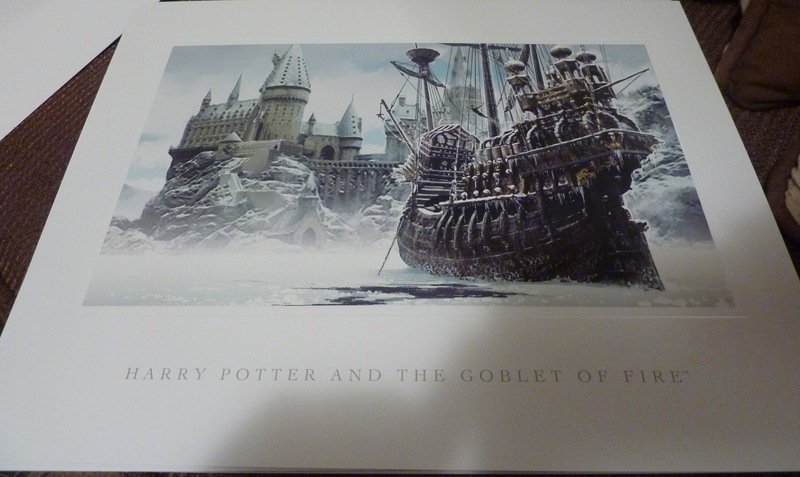 The front is the familiar poster with the Diagon Alley picture. The back has a map to the attraction. 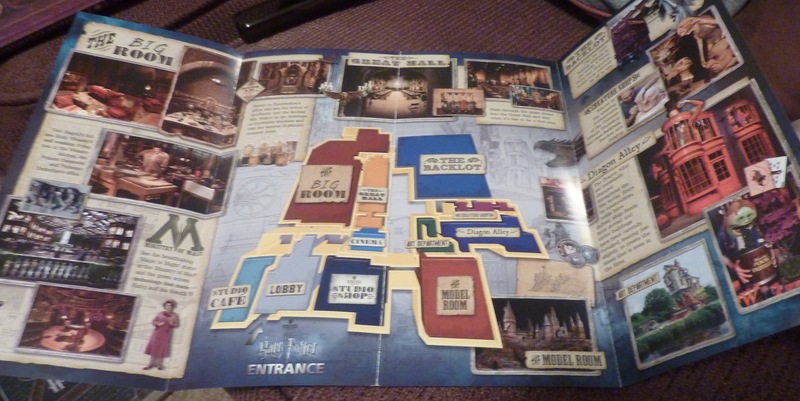 When you fold it out first you see the Great Hall doors with Secrets Will Be Revealed and then opening it fully shows a map of the attraction with details of what you can find there. It shows the Studio Cafe, Lobby, Studio Shop, Cinema, The Great Hall, The Big Room, The Backlot, Creature Shop, Diagon Alley, Art Department and The Model Room. I am already looking forward to my December visit and hoping that the shop has my desired purchases in stock ready for me to buy myself early Christmas presents. 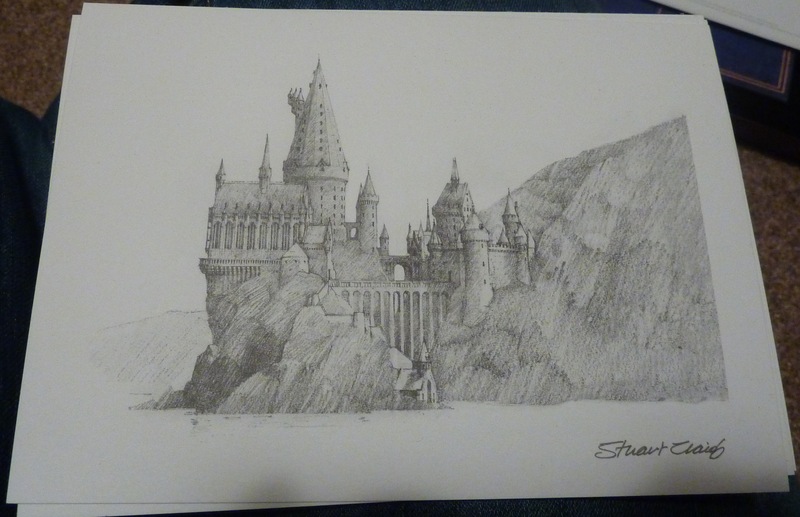 The five 5”x7” sketches by production designer Stuart Craig, who basically bought JK Rowling’s locations to life each have his signature and comes in a white envelope with a sketch of Shell Cottage on the front and Stuart Craig Sketches written across the flap at the back. I’ve seen some of these at the studio tour and they are beautiful. These coloured paintings are suitable for framing, they are 8”x10” and there is one for each film, as follows. 1. The Chess Set surrounded by fire with the Knight and a pawn on opposite sides of the board and shadows of the trio on the floor. 2. Trees from the forest (an owl is on the branch of one) and then Hogwarts on the lake. 3. The Whomping Willow having just shed its leaves and Hogwarts. 4. A snow covered Hogwarts and the Durmstrang ship (with someone diving off it) on the lake (shown above). 5. The top of Hogwarts (Dumbledore’s office) with 6 Thestrals in the sky. The 6 flying to the Ministry to ‘save’ Sirius. 6. The rock in the sea surrounded by violent waves with small silhouettes of Dumbledore and Harry on top. 7. 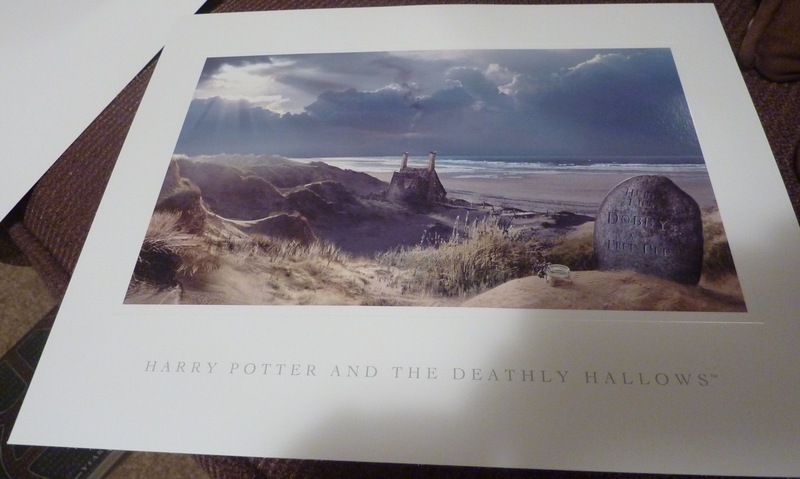 Dobby’s Grave :o( on the dunes (Here Lies Dobby A Free Elf) with shell cottage and the beach behind (shown below). In the left side coloured secret compartment is a little scroll with a black ribbon. This contains the codes to the Ultraviolet copies. This is my first experience of Ultraviolet. The top of the certificate says – Ultraviolet for all 8 films, instantly stream and download now. It expands later and says you can download to your computer and compatible devices. You have to create a Flixster/Ultraviolet account which was fairly simple. You have to redeem by early September 2014. A personal bugbear is that the version of the first film is called Sorcerer’s Stone even though this was the UK copy!!! Grrrr. Philosopher’s already. Also I don’t actually have room to download to my iPad through you can stream via the Flixster app via wifi. Be warned it will take a while to download all 8 to your computer (again this uses the Flixster App on the Mac). This textured creamy 8”x10” certificate shows what number your collection is out of the 63000 produced and 2012 the year of production. I wonder whether JK Rowling was given no 1, Daniel 2 etc. Mine is no 35807. 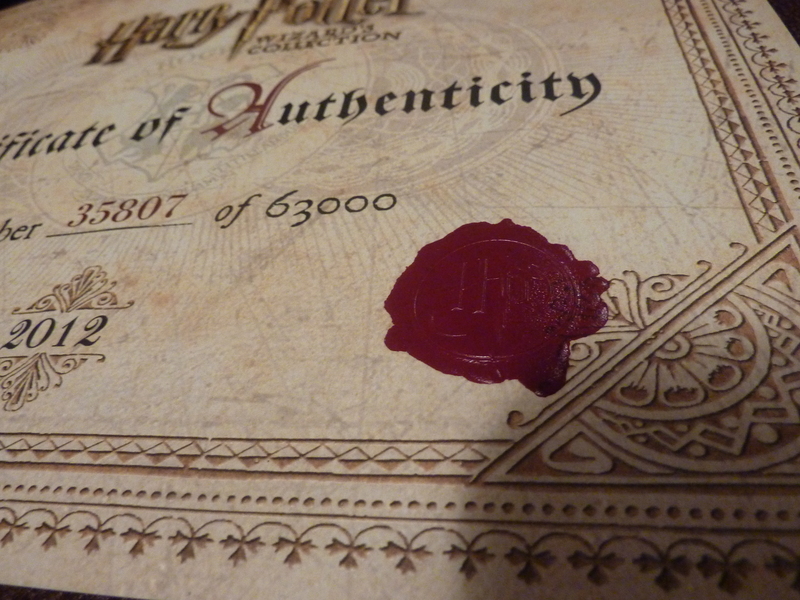 There is a red wax seal similar to that on Harry’s letter in the bottom right but with HP inside. And that’s it. Yes it is expensive but it is a Collector’s Edition, people have always paid more for collector’s items and you aren’t just buying the films again, you are buying a piece of history. As noted before lots more pictures to be posted on my Tumblr blog – I have daily posts queued until the end of the month and beyond. I’ve watched the first two parts of Creating the World of Harry Potter (not having owned the Ultimate Editions) at over an hour each so don’t expect these posts to arrive that soon. Posted on September 16, 2012, in Kirsty rambles on about life, the universe, tv, and everything!, Reviews and tagged Blueprint Map, Certificate of Authenticity, Cloth Map, Concept Art, Concept Sketches, Harry Potter, Horcrux Locket, The Wizard's Collection, Ultraviolet, WB Studio Tour. Bookmark the permalink. 2 Comments. I have to say i absolutely love this post that you have made about the Harry Potter Wizards Collection. You explain everything in absolute detail ! This is out of the blue but might i ask a favor of you ? 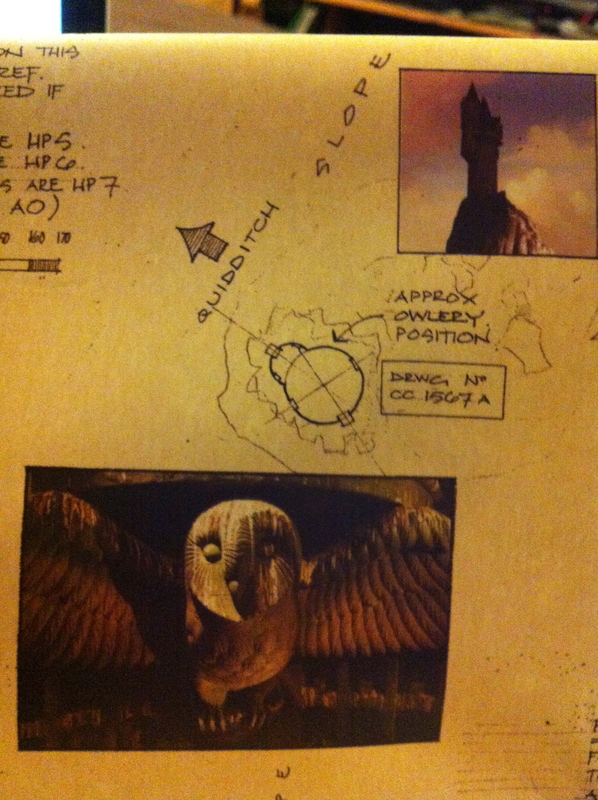 If possible would you mind sending me a scanned copy of the blueprint map of Hogwarts Castle ? Its for personal use i promise. It would mean the world to me if you can do that .If not ..eh well no hard feelings , life goes on . Hi Artan. Thanks for the feedback. I’m afraid I haven’t got the capacity to scan the blueprint.